There will be four groups roleplaying within the Faire sims, weaving special storylines tied to the Fairelands. We will be following their path here on the blog, but you can also catch them and perhaps even join them in the Fairelands! We are delighted that all three groups are returning from last year’s Fantasy Faire. Once again we will have a dark steampunk adventure from the NeoVictoria Project (who in past years have given us the delightfully sinister The Revenge of Professor Timmons and White Wedding), a dark roleplay from Sanctuary (who have given us a popular murder mystery Mourningvale Sanctuary and a nail-biting trial with The Origins of Sanctuary: Lut’s Story), and the Rickety Weasels (who have presented the exuberant adventure stories The Rickety Weasels on Wiggenstead Mooring and The Tears of Poppetsborough). This year, we will be joined by a group from The Great Alliance, who have an exciting story for visitors to the Faire to follow and take part in if they so wish! You’ll be able to follow the roleplay stories through the roleplay pages on the blog, and through announcements and news bulletins on Fantasy Faire radio. And there will be special events that you can attend – and sometimes, if you like, join in yourselves! Long ago, a sidhe failed in their duty and let a nameless terror into the worlds. This cost them their life, but not their soul. That was put into a mechanical marvel, and so began their long service as a sentinel against the darkness. But after so long, their mechanical body has begun to fail, and that nameless evil escapes its bonds. The automaton sends word to the Sidhe Empire for assistance. Will help arrive in time? Join the NeoVictoria Roleplay Group for this very special series of roleplay events: “The Sidhe and the Soul-Eater“, coming to the Serenity SIM in the fairelands on Friday, April 22nd. Read more about The NeoVictoria Project here. The NeoVictoria Project will be based in Serenity. A land divided between light and dark, life and death, good and evil. The dark prince seeks to take the hand of light queen in marriage and extend his influence over both lands. In desperation to stop such a diabolical union from taking place, the queen now uses the opportunity of the faire and the nobles it brings to find a suitable suitor to wed before the dark prince seizes her. However, everything is not as it seems. The dark prince is not so naive and will not be bested so easily. Deception fouls the air of the court, mystery surrounds the many patrons that meddle with one another, and the fate of Twilight Illusion hangs in the balance…. Join the Great Alliance for our very special series of roleplay events, starting on Friday 22nd April and taking place on Twilight Illusion in the Fairelands. Read the Timetable of Events here. Read about the Great Alliance here. The Great Alliance will be based in Twilight Illusion. Some believe blood is where the spirit resides. But what is in the blood of angels slain in a war of Heaven and Hell? The answer is … a terrible rage and hatred for all things divinely created. A being long forgotten and imprisoned has awakened and is breaking his shackles. What does he want? The destruction of everything the divine has ever created – starting with Sanctuary. Nothing on Earth, Heaven or Hell can stop it. But what if – somehow – all three could be combined? Heroes and villains are needed to unite to defeat a mutual enemy and stop the Blood King’s rise or all of creation will ultimately be destroyed. See here for days and times. Read more about the background to the story here. Read more about Sanctuary here. Read daily updates of the story. Sanctuary will be based in Dangarnon. Echtra is a land stuck in time where the seasons have ground to a halt. There is no summer nor is there any winter. A grey emptiness has fallen over the once busy land. Legend tells of a great sleeping dragon under the hill and two children, a Prince and Princess, who lie at the source of this terrible curse. The stories begin April 23rd at 2pm slt in the gloomy realm of Echtra. 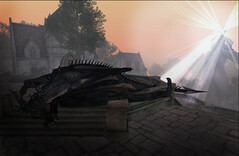 A HUD will be used to progress the story allowing participants to catch up on the events at any time after they have passed.